Last Friday, new data was released by the Bureau of Economic Analysis (BEA) with the headline being a 4.1 percent annualized rate of GDP growth. Supporters of the Tax Cuts and Jobs Act (TCJA) have pointed to this data point as proof that the tax cuts are working, though there’s little indication that economic growth has moved off its previous trend. But the release of new economic data does give us another chance to see what that data is telling us so far about the effects of the TCJA. The punchline is simple: the TCJA has already fattened up the incomes of capital owners and corporations in a measurable way, but there’s no indication at all that any of it threatens to trickle-down to workers. The corporate sector is unsurprisingly where the clearest near-term effects of the TCJA can be seen. Domestic after-tax corporate profits increased from 6.7 percent of GDP in 2017 to 7.4 percent in the first quarter of 2018. In particular, undistributed domestic corporate profits surged in response to the TCJA’s tax windfall for multinational corporations on the profits they had booked offshore. 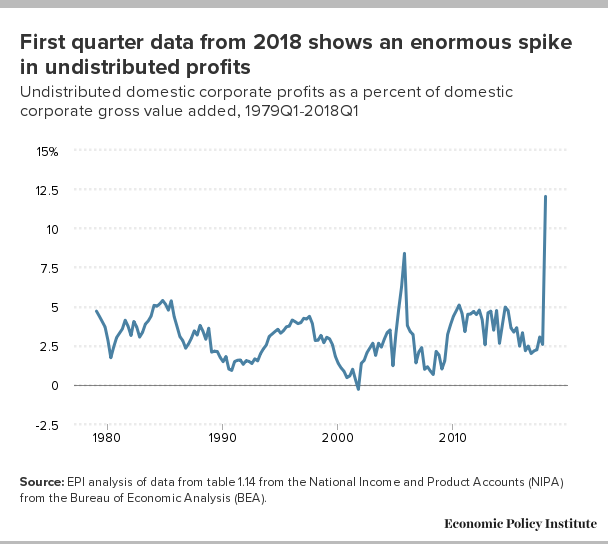 As the chart below shows, much like the spike following the 2004 repatriation tax “holiday,” undistributed domestic corporate profits rose from 2.5 percent of gross domestic corporate value added in 2017 to 12 percent in the first quarter of 2018. We should note that 2004’s tax holiday didn’t lead to a surge in wage growth in subsequent years. Source: EPI analysis of data from table 1.14 from the National Income and Product Accounts (NIPA) from the Bureau of Economic Analysis (BEA). Corporate tax revenues as a share of the economy fell by more than a third, from 1.8 percent of GDP in 2017 to 1.1 percent in the first quarter of 2018. This data makes it clear that the TCJA made some people very rich in the first quarter of 2018. (Second quarter corporate data has not been released yet.) Does Friday’s data on the overall economy show any indication that the corporate tax cuts have started to trickle down to workers as the Trump administration promised? Nope, not at all. For one, wages haven’t budged. To be fair, no serious economist should have argued that wages are expected to respond immediately to corporate tax cuts. Though that didn’t keep TCJA supporters (including some economists willing to act unserious) from touting bonuses paid late last year as proof that the tax cuts were working as intended. It’s worth reminding ourselves of the economic chain of causation that leads from corporate tax cuts to wage growth. First, the direct benefits of corporate tax cuts flow entirely to shareholders. That part has definitely happened. Then, (as we’ve previously explained), higher after-tax profitability is supposed to incentivize firms to invest more, with those investments financed by the higher savings that households provide in response to higher returns. These investments in turn are supposed to give workers more and better tools to do their jobs, which boosts productivity and eventually that increase in productivity translates into wage growth. This means that investment is the key indicator to watch to try to see if the corporate tax cuts are working as promised. This investment boost is the first link in this long chain—other links can fail even if this one holds, but the entire chain fails if this first one never comes through. The initial data didn’t indicate any sort of clear boost to the trend of investment that would constitute a positive effect coming from the TCJA. And this quarter’s data is no different. 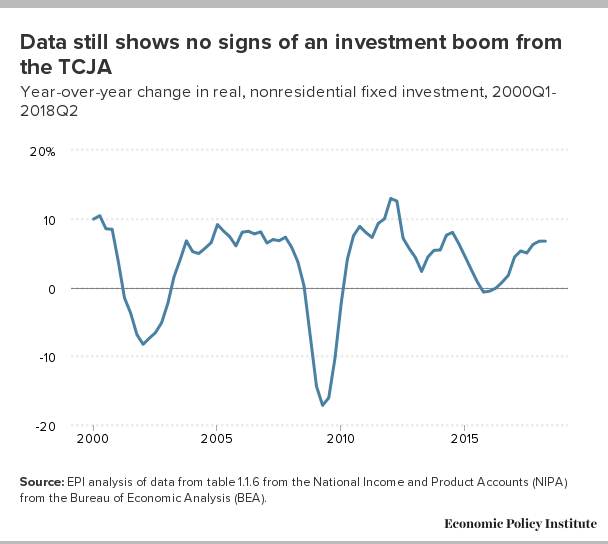 As the chart below shows year-over-year growth in real, nonresidential fixed investment is roughly unchanged from the first quarter of 2018 and still doesn’t show any rapid upsurge of investment due to the TCJA. Past experience with corporate rate cuts remains the best indicator of what this round of cuts is likely to do. And that real-world evidence doesn’t support that corporate rate cuts will help typical American families. As their first round of corporate tax cuts continue to fail to live up to the hype, rather than reversing course, House Republicans are doubling down, unveiling a second round of tax cuts. But the priority for tax policy going forward shouldn’t be locking in further regressive tax cuts, it should be rolling back the legislation’s business tax cuts, which are egregiously regressive and an ineffective way to raise the pay of typical American families.